That’s right, it’s only September but we’re going to start talking about Christmas already. As those of you who have been to Kennebunkport’s Christmas Prelude holiday festival know, you’ve got to plan early because things sell out quickly! For those of you who haven’t attended a Christmas Prelude yet, let’s see if we can convince you to come up and experience it for yourselves. 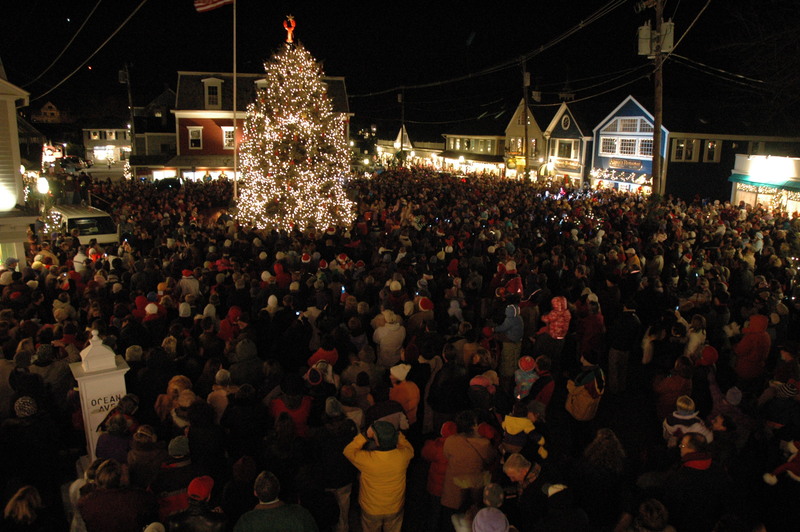 The concept for Christmas Prelude originated in 1982 when a group of local business people got together to discuss ways the business community could create some Christmas spirit for the residents and visitors to this beautiful southern Maine coast village. That first year’s events included a tree lighting and chorale concert with candlelight caroling and Santa arriving in Dock Square (keeping with the Maine theme) on a lobster boat. 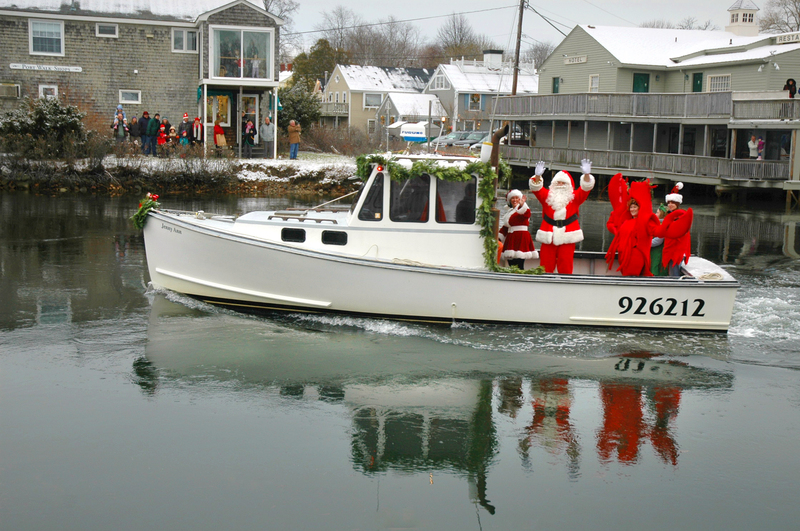 From that first weekend 34 years ago, Kennebunkport’s Christmas Prelude has grown into a two week festival with Arts and Craft Fairs, parades and special events hosted by various businesses throughout Dock Square and Lower Village. The entire two weeks of activities and events is developed, managed and paid for by the businesses of Kennebunk and Kennebunkport. That includes decking the halls (light posts, etc.) in the towns and the Christmas trees in Dock Square, Cape Porpoise and Lower Village. The “traditional” first weekend includes a Friday night tree lighting ceremony in Dock Square at 6pm. Craft Fairs abound on Saturday with local Maine and New England crafts of all sort and description. What a perfect way to kick off your holiday shopping by finding that unique gift for your hard to buy for person! 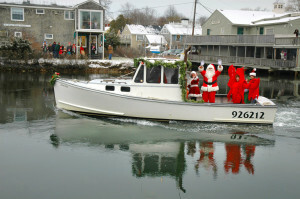 Sunday sees Santa arrive on his Lobster Boat. The second Prelude weekend has quickly become just as much fun with some special happenings for that weekend only. These include fireworks following the tree lighting in Dock Square on Friday night. The Nonantum Resort’s Fire and Ice tickets sell out ahead of time. Billed as “Blazing Bonfires, Ice Bars and Sculptures, Local Food and Drinks and Live Music”, this is worth the price of admission! Another signature event that weekend is the Historic Inns of Kennebunkport (1802 House is a member) Walk to Bethlehem at sundown on Saturday evening. Starting at Kennebunkport’s Village Green, join us for caroling and follow Mary and Joseph as they try to find a room for the night. We end with cookies and hot chocolate in the manger. This event is open to all and there is no price for admission. For those that want a chance to peek into these old homes, the Historic Inns will be open for Inn Tours on Sunday, December 6th, following breakfast and check outs. Those are just some of the highlights. We also have a Pet Parade, Hat Parade, chowder luncheons, trolley rides, gingerbread house making, a firehouse lobster bake, Christmas Karaoke and phew……so much more still being added. You may have to come back a couple of times to fit it all in. A full schedule is available online with more being added as we speak. Our weather that time of year is historically cold with light snowfall. So pack your winter coats, hats, gloves and boots and head up to Maine to celebrate the season with us. Rooms are booking fast so call today to make your reservation. We look forward to celebrating the holidays with you.